St John Fisher was the learned and heroic Bishop of Rochester, was the only one of all the Bishops of England and Wales refused to consent to Henry VIII's Act of Supremacy of 1534, the Act supporting to separate the kingdom from the jurisdiction of the Holy See. He was executed on 22nd June 1535. 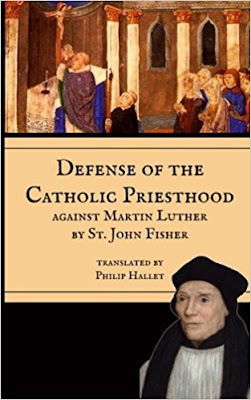 He had earlier written a book against Luther defending the Catholic theology of the priesthood: ironically, in support of Henry VIII's own work against Luther, to which Luther had made a characteristically intemperate response. Fisher's work deserves wider recognition, and I am pleased to see this new edition and printing available. It can be bought from Amazon here.